In a phone conversation today with my Uncle Tim Tillotson, who lives in Virginia, he initially had no recollection of Tillotson Construction Company’s elevator in Dallas Center, Iowa. He put this down to his hitch in the Army from 1955 to 1957. After a while, though, the name Dallas Center started to come back to him a little. Uncle Tim reckoned it was indeed among the dozens and dozens of Tillotson Elevators. 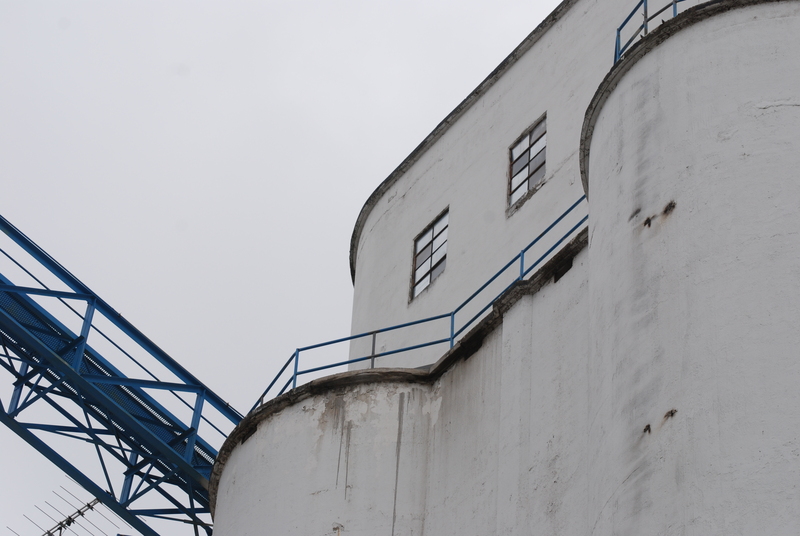 This was the first he had heard about Our Grandfathers’ Grain Elevators. (We played phone tag in January and now finally got in touch.) He said he would look at it at one of his neighbors’. He doesn’t have a computer. We’re hoping he can come up with some pictures and maybe a few documents, and that his memory is sparked. One question to me was whether we’re aware of the distinctive architectural styles of individual construction companies. I could answer that indeed we are, thanks in large part to Gary Rich’s expositions through words and pictures. A Tillotson characteristic is the rounded headhouse, also called a cupola, which Kristen has so graphically captured in this image. It’s good to see the window panes have been replaced as they’ve broken: I presume that explains the checkerboard pattern. But then after all, in Dallas Center, as Kristen points out, the Tillotson elevator is at the center of the community, so naturally it’s kept up. This entry was posted in Their Work, Tillotson Construction Company and tagged architecture, Business, construction, Dallas Center Iowa, grain elevator, slip-formed concrete, Tillotson Construction.